The Playback Control settings let you set controls during playback and capture. It also sets your options for Parental Control, preventing unauthorized users such as children and minors from viewing movies that have a high MPAA rating. Languagemate, a feature that lets you take advantage of learning a new language through repetition, can also be set. 1 On the Setup dialog box, click the Playback Control tab. 2 In Bookmark/Capture Configuration, choose the destination folder of your bookmarked/captured images and movie clips. 3 In Control Timing Configuration, set the length (in seconds) of instant replay playback or set the number of seconds to jump ahead in the title. 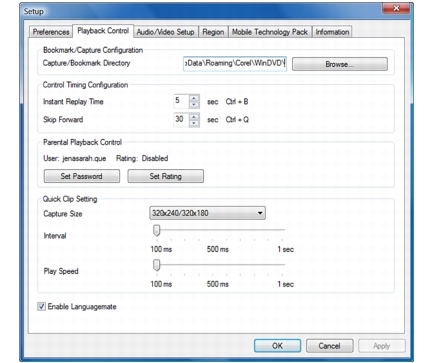 The default speed for the Instant Replay Time and Skip Forward features are 5 and 30 seconds, respectively. 4 Click Set Password to set parental control restrictions for a DVD that is above the rating limit specified in the Set Rating option. 5 Click Set Rating to set the maximum rating (i.e. All Ratings, G, PG, PG-13, R, and NC-17) allowed for viewing movies in WinDVD. · In the Capture Size drop-down menu, choose the default image size for captured clips. Drag the Interval slider to adjust the default time period between each captured frame of the clip. Drag the Play Speed slider to adjust the default speed of the clip. 7 Select Enable Languagemate to enable LanguageMate™, a WinDVD feature that lets you learn a new language during playback.